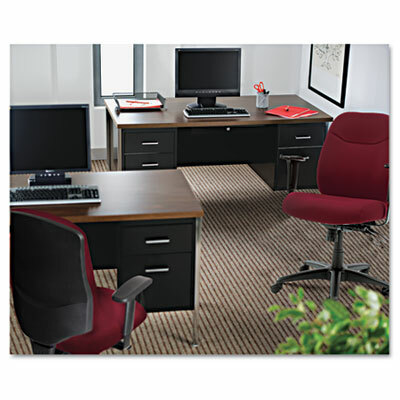 Durable square edge laminated top is scratch- and stain-resistant. Powder coated steel frame with chrome-plated 1" square tubular steel legs. Full-extension locking file drawer with telescoping ball bearing slides accommodates hanging file folders. Box drawer with dividers operates on steel roller suspensions. Center drawer lock secures all drawers. Aluminum drawer handles. Three-quarter height modesty panel provides privacy. Leveling glides adjust for uneven floors.